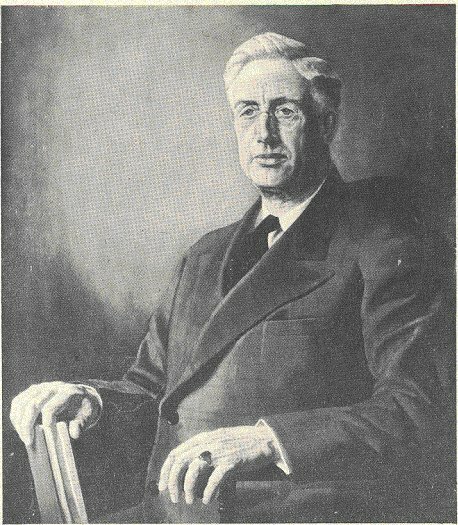 George W. Stewart was Professor of Physics and Head of the Department of Physics at the State University of Iowa from 1909 to 1946. He continued to be actively engaged in his chosen field until his death in August, 1956. Dr. Stewart was a distinguished scholar and teacher who contributed substantially to the development of the study of Physics at the State University and to the intellectual life of the University generally. He was the recipient of many honors, including honorary degrees from DePauw University, the University of Pittsburgh and Kalamazoo College. He was a fellow of the American Academy of Arts and Sciences, the American Physical Society, of which he was President in 1949, and a member of the National Academy of Sciences, The American Association of Physics Teachers (Oersted Medalist I942) and many other learned and professional societies. Professor Stewart was instrumental in the founding of the School of Religion at the State University of Iowa, and from the School's beginnings he was one of its most enthusiastic friends and supporters. For many years he served on the School's executive committee, and during the last fifteen months of his life he was President of the Board of Trustees. The relationship between science and religion is a perennial concern in our culture. It is an area which should and does command the attention of able men representing various fields. Desiring to encourage further thought and discussion about this relationship, the School of Religion at the State University of Iowa has projected a science and religion lectureship series. The School was honored to present as the first lecturer in the series Professor Harold K. Schilling, Professor of Physics and Dean of the Graduate School at the Pennsylvania State University. Dean Schilling is ably qualified to head this series. He has long manifested an interest in the relationship between science and religion, and he shows both in his thinking and in his professional position the kind of substantial and imaginative approach which the subject warrants. It is also fitting that Dean Schilling should have delivered this lecture as a memorial to Professor Stewart, who was Head of the Department of Physics at the State University of Iowa when Dean Schilling received his doctor of philosophy degree from this institution. "Studies in Science and Religion" was one of the initial projects selected for support by the Old Gold Development Fund, a fund organized by alumni of the State University of Iowa as a channel for contributing to certain aspects of the work of the University. This selection has made possible the science and religion lectureship series. The School of Religion acknowledges with gratitude the selection of this project and its support by the alumni of this University. The lecture, Concerning the Nature of Science and Religion: A Study of Presuppositions, was delivered by Dean Schilling on October 31, 1957. It is published here with only minor changes. Publication of this lecture has been made possible by Mr. Rodney Stewart, son of Professor Stewart. The faculty and trustees of the School of Religion wish to thank Mr. Stewart for his generous gift. All of us who were graduate students in physics here at Iowa while Professor Stewart was head of the department owe him a great debt. He was a man of impressive intellectual stature, who insisted on high educational standards and made heavy demands upon himself, his colleagues, and the students in the department. For this we are grateful, because it insured for us thoroughly sound training. There is good reason therefore why those of us who were fortunate enough to pass the hurdles and complete our graduate work here are proud to hold the Iowa doctorate in physics. Professor Stewart was also a very human person who was genuinely interested in all of us personally, as well as professionally. This concern, related to our general welfare as well as to our specific needs and problems, was in evidence while we were in residence here and followed us after we departed. He never tired of hearing about our teaching, our research, and any other activities we were engaged in. He always wanted to know about our families and our institutions. And he was always ready to give aid, encouragement, and kindly advice. He helped us to get jobs, and sometimes to change them. Many of us therefore counted him as our friend and are proud he so regarded us. I personally was not one of his students, in the sense of having had courses with him or doing research under his supervision. Nevertheless he maintained down through the years as lively an interest in me and my work as if I had been. I turned to him for help and advice many times. We became very good friends, and I developed for him not only a high degree of respect and admiration but also deep affection. I shall not presume, on the campus of this University where he was for so many years one of the most distinguished members of the faculty, to enumerate his achievements or the honors that have come to him. I count it a great honor to have been invited to give this memorial lecture in his honor. A great deal has been said about so-called presuppositions as part of the perennial discussion of "science and religion." Unfortunately, however, the term "presupposition" is a deceptively slippery one whose meaning tends all too easily to slide about in an argument, thus confusing issues. Also in some of its meanings it is loaded with emotional and prejudicial overtones that may actually create false issues and lead to rather curious sorts of polemic. Thus it is often asserted that religion and science are incompatible because the former requires one to begin by accepting prescribed presuppositions, whereas in the latter one starts "only with the facts"; whereupon the frequent countercharge is that science also has presuppositions and that these are quite as restricting and prejudicial as those of religion. Apparently, according to this kind of argument presuppositions are intrinsically bad, and no less so for science than for religion. Now if there is an issue here, it certainly cannot be whether there are presuppositions or not since surely they are inevitable but rather what they are, and whether they are legitimate, significant, and fruitful. Do they represent truth? How do they affect the methodology and content of science and religion? Obviously, this is a vast subject, and I can discuss only a small part of it. The particular questions I shall consider are, first, what kinds of presuppositions are mentioned in the literature, second, what their roles are, and, third, what a study of them reveals about the nature of science and religion. In what follows the term science will refer only to the natural sciences. The term religion will stand for both experiential and interpretive religion, i.e., theology. According to this usage, which I understand is one of the standard ones, theology is not separate from, but a part of religion, just as theoretical physics is integrally part of physics. The literature1 of our subject is extensive and presents a disconcerting variety of usages of the term "presupposition." These may refer to basic attitudes and capacities of man, or to elements of common knowledge. Some express intuitive insights assumed unconsciously. Others are carefully formulated propositions about, say, nature, truth, reality, method,etc. Some should doubtless be referred to as postulates, others clearly as implicates. In short, the term stands for a wide spectrum of elements upon which the existence of science and of religion is alleged to depend, ranging from common sense points of view to sophisticated theorems of metaphysics and epistemology. In analyzing this welter of material two kinds of distinctions are useful: one of definition, the other of c1assification. As to definition, we can recognize two basic meanings of the word presuppositions: first, that which is antecedent to formal knowledge; second, a supposition adopted as a basis for logical inference. The latter I shall call formal or explicit, the former informal or implicit. As to classification, the presuppositions I have encountered in the literature seem to me to fall into five rather easily distinguishable classes. While I shall identify all five of these, I shall not have time to discuss more than the first four in this lecture. My survey will take the form of brief lists of typical presuppositions, for which I claim neither logical coherence nor completeness. Nor would I defend all the items in them as being either reasonable or necessary. Indeed some of them I regard as untenable. 1. I exist, and have existed prior to the present. 2. There are and have been other selves more or less like myself. 3. Selves can communicate meaningfully. 4. There exist entities independent of minds. 5. Propositions are true or false, valid or invalid, meaningful or meaningless, etc. 6. In developing a set of related propositions, the use of indefinables is inevitable and indispensable. 7. A system of propositions should be internally consistent, i.e., not contradictory. Obviously this set is neither coherent nor complete. Like the lists that follow, this one is merely an unsystematic assortment of samples. 1. Basic to science are such human qualities and values as intellectual curiosity, imagination, independence of mind, freedom to follow the truth wherever it may lead, cooperation, mutual confidence. 2. Science results from the primal human urges to observe, reason, symbolize, conceptualize, generalize, to count, measure, experiment, etc. 3. These tendencies of man are valid and good, and lead to reliable	knowledge. 4. Man must make choices among alternatives when observing, experimenting, forming concepts and mental constructs, and setting up theoretical systems; and the knowledge he achieves depends in part upon such choices. 5. The progress of science depends upon the honesty of scientists in making observations, weighing data, drawing conclusions, and reporting their findings. 2. Nature exhibits orderliness and regularity. 4. Nature is mathematically explicable. 5. When we measure something we know it. 6. Phenomena and events occur in space and time. 7. Nature does not change basically in time, i.e. natural laws are independent of time. 8. Nature's characteristics are the same throughout space, i.e., the natural laws discoverable here are no different elsewhere. 1. There are absolute space and relative space. 2. Space is Euclidian (or Non-Euclidian). 3. Matter-energy is quantitatively constant in time. 4. The second law of thermodynamics applies to the universe regarded as a closed system. 5. Objects are localizable in space and time. 6. It is natural for a body once set in motion to move indefinitely far along a straight line without a motor. 7. Matter is atomic rather than continuous (or it is continuous). 8. Radiation is continuous rather than atomic (or it is atomic). 9. Present physical events are the effects of past causes. 10. The future is determined by the present. 11. The universe exhibits the dynamic tendency of evolution. 1. There is no reality aside from the physical. 2. No physical event occurs without a prior physical cause. 3. A given cause cannot produce different effects. 4. Minds are not direct causes of physical events. 5. There can be no "action at a distance." 6. "Observers" cannot "perceive" anything except when by a physical process one or more of the normal sensations are produced. 7. There can be no genuine "foreknowledge" of future events. An overall look at the four classes I intend to discuss reveals that the first three differ fundamentally from the fourth. For one thing, they play no important role in the thinking of most scientists, as scientists, and are not a significant part of the subject matter of science. Except for rare, occasional mention, one looks for them in vain in the standard treatises or research journals of science. Many scientists have gone through years of rigorous education and training without ever having heard them mentioned, much less systematically discussed, in science courses or seminars. In other words, scientists ordinarily enter science without benefit of such presuppositions, and once in they go about their business without paying any attention to them explicitly. They don't feel any need for them in their work. It is almost only when they relax from their work in the bull session or at the dinner table, or when they become, so to speak, philosophizers around the potbellied stove and the cracker barrel, that they talk about such basic postulates or assumptions. If anyone were to ask them to discuss such presuppositions formally, most scientists would deny being competent to do so. They would protest that such assumptions are only indirectly relevant to the scientific enterprise, that scientific inquiry would "go on" whether anyone was aware of them or not. Many would even admit finding it distasteful to engage in the kind of thinking they represent and would assert that ignorance in such matters is no serious handicap in scientific endeavor. This is not to say that they are unimportant. On the contrary, they are very potent. I believe, however, that while they are presented here, as elsewhere, in postulational form, their actual role in the lives of most scientists is almost exclusively that of unexpressed predispositions, rather than assumptions. They are, typically, submerged in the subconscious, and do not originate in deliberate cerebration. They represent not a premeditated logical laying of foundations, but a simple, mostly unconscious taking things for granted as being what on the surface they seem to be; and they may be regarded as expressions of a sort of elemental realistic faith or confidence in nature, and in man's ability to understand it. I use the word "faith" here in its most basic meaning, not as intellectual assent to propositions, but as a state of mind, an orientation, an unformulated point of view, and a trusting relationship and commitment. It is in this sense that these presuppositions are determinative in science, and not because they constitute the formal foundation of inferential lines of thought. This is why, I believe, Whitehead has insisted so often that science is an enterprise in which reason is based on a faith, rather than one which has a faith based on reason. This explains why he can say that "it is essentially an antirationalist movement, based upon an instinctive conviction and a na�ve faith," and that "this faith cannot be justified by an inductive generalization. It springs," he says, "from direct inspection of the nature of things so disclosed in our own immediate present experience," and "is impervious to the demand for a consistent rationality. "2 Science is, as I see it, an exciting adventure, an enthusiastic, lusty sport, more than a coldly calculating chess game. It is, first of all, a hearty response to nature, springing from a compelling curiosity about it and from sheer pleasure in observing, and thinking about its phenomena. In part, it is also a yielding to the lure of the world of theory related to nature, and springs from the pleasure of manipulating and exploiting mathematical symbols and theoretical concepts. Getting into science is much like falling in love. A young man meets a girl. He thinks about her, talks about her - but not in terms of propositions about her or about love in the abstract. He launches out into the deep without systematic thought. Science is also much like art, which certainly is basically a spontaneous, unpremeditated response to aesthetic reality. I would assert that science is the way of a man with nature, much as love is the way of a man with a maid, or art the way of a man with beauty. If this is true these presuppositions of the first three types play no formal role in science akin to that of axioms in mathematics. Unlike art, or the business of falling in love, mathematics is largely an enterprise of logical development of consequences derivable from presuppositions. Thus, without particular axioms there would be no rational Euclidian geometry. Non-Euclidian geometrics are different from it because their postulates are different. The structure a mathematician develops must conform completely to the postulates implying it. Sometimes, of course, the superstructure of theorems already exists, at least in part, and the mathematician's job is to construct for it the appropriate foundation of postulates, the goal being to establish logical consistency of the total system. Certainly the unformulated predispositions and presuppositions I have spoken of thus far have a very different relationship to the total system of a science. Having dealt with certain presuppositions in so far as they are implicit in science, we must now look at them in their more formal role. After all, one does find them stated in print explicitly. Apparently our hidden, elemental predispositions do somehow rise from the subconscious levels and appear in the open, where they are analyzed and given conceptual content. Several things should be said about them. First, these explicit postulational formulations are the products, rather than the bases of inquiry. Furthermore, they come into being as answers not to scientific queries, but to metascientific ones; to questions not of science, but about science. Certainly they do not arise as part of the scientist's inquiry into the behavior of light, the isotopic structures of the chemical elements, or the mechanics of genetics. Rather they come out of an analytic search for the postulates that should, perhaps, underly science, and represent the kind of thinking that is native to metaphysics. Next, such analysis, even if it is mostly philosophic rather than scientific, is of great value to science. It is always desirable to unearth hidden assumptions, and to strive for logical consistency. It clears away the cobwebs and removes barriers to progress. This is why increasing numbers of scientists are showing interest in such questions, and why some are insisting that such self-analyses are an important responsibility of science itself. It is important, however, to realize that such precisely formulated presuppositions are mostly afterthoughts, actually postsuppositions that come from a study of science already in being. They are seen by looking backward. Paradoxical as it may sound, they represent, it seems to me, a "fitting" of the "foundation" to the superstructure ex post facto. Far from being propositions that consciously predetermine thinking in science, their nature is such, I believe, that they are achievable explicitly only by him who is already competent in such thought. That they are important to philosophers is obvious, but to most men of science they take on significance only when, after having engaged in considerable productive work, they stop to put their houses in order logically and philosophically. Up to that point there has been no compelling need for them. Before proceeding to the next subject, let me repeat, for emphasis, that though some scientists find it necessary some time or other to formulate presuppositions of the first three classes, most of them, I believe, never do. Moreover, for the few that do, the urge to do so only rarely arises from their scientific work. The situation with respect to the fourth kind of presupposition is very different, but more of that later. Now let us turn to religion. It seems to me that the situation there is surprisingly like that in science, and that virtually everything said thus far applies in principle equally well to religion. Thus both have presuppositions of the first three classes. Looking at these in turn, those of the first, referring to common knowledge, appear to be essentially the same for both. Certainly religious thought, at least that of the Judaeo-Christian tradition3 also assumes the existence of communicating selves; the reality of entities independent of minds; the possibility of truth, validity, and meaningfulness; the inevitability of indefinables; the need for logical consistency; and so on. Likewise, religion is said to have presuppositions of the second class, those asserting its dependence upon such elemental human qualities as curiosity, imagination, cooperation, trust, freedom, and honesty. Furthermore, religions thought could not exist any more than could science without the primal urges of men to reason, symbolize, conceptualize, generalize, and systematize. Here, too, we assume the capacity and need of choosing among alternatives of hypothesis, mental construct, and conceptual system. It is, however, at this point in the spectrum of presuppositions that we must also notice, in addition to the similarities, certain significant differences between those of science and of religion. This is, of course, to be expected since science and religion do represent different aspects of human experience, and therefore involve certain different human capacities and urges. For example, man's universal tendency to worship and pray is fundamental to religion, but not to science; whereas his predilection for experimentation and measurement is basic to science, but not to religion. In the third band of the spectrum also we find many presuppositions common to both science and religion. Here it was that we encountered the assumptions about the reality, intelligibility, and orderliness of nature. These are regarded as basic also to Jewish and Christian theology. In this class, however, the bifurcation of the spectrum separating the scientific from the theological presuppositions becomes even more evident than in the second. Here we find, aside from those common to both fields, a series of presuppositions that are distinctively characteristic of religious thought, but completely irrelevant to science. Some of these are analogous to those referring to nature, which we have just said are accepted by both religion and science. 1. The realm of the spirit, the holy or noumenous, is real. 2. The realm of the spirit exhibits orderliness, regularity, and cause-and-effect relations. 3. The realm of the spirit is intelligible. 4. The realm of the spirit is religiously explicable. 5. When we worship we gain spiritual insight. 6. God is real and can be known. 7. God and the realm of the spirit are basically unchanging in time. It is evident, then, that religion is said to have the same first three classes of presuppositions as science-and in many cases even identical presuppositions. The next thing to note is that in religion too these are basically implicit and unformulated. They express a faith-relationship to God analogous, though clearly not identical, to the scientist's relationship to nature. They represent, first of all, insights derived not from speculative or inferential thinking, but from direct experience of the individual and the religious community with the realm of the holy and the divine with God. Certainly they are not like mathematical postulates, and they do not constitute evidence that religion is "based" logically on metaphysical assumptions or religious dogmas to which assent is required in advance. It cannot be emphasized too much that the primary justification of religion, as of science, is not rationalistic or logical. The way one enters religion is by yielding to a pull which acts upon one. It too resembles falling in love and art. It is this experience of encounter and response that constitutes the determinative religious faith in its deepest meaning. Certainly this is the foundation of Christianity. That these first three types of presuppositions do indeed function mostly implicitly in religion is evidenced by what I regard as a fact, namely that most believers (so-called) have never heard of most of them, and seem not to need them explicitly. Like the corresponding ones of science, they are regarded widely as belonging mostly to philosophy. The thinking they represent is more metaphysical than religious. They become explicitly formulated mostly in their "post" phase, as afterthoughts or postsuppositions, when the individual believer or the church seeks to systematize thinking about religion or to establish a logical foundation for it ex post facto. Professor F. S. C. Northrop has distinguished between concepts-by-intuition and concepts-by-postulation.4 The former result from immediate apprehension of experience, the latter from deliberate, systematic thought. Thus the term " light " as a concept-by-intuition represents something known with experiential immediacy, though as such it is not precisely definable; whereas "light" as a concept-by-postulation is something carefully defined and postulated as a basis for theorizing. I suspect that Professor Philipp Frank is making essentially the same point in his book, The Philosophy of Science, when he points out repeatedly that the language of science operates at two levels, first, that of common sense experience, and, second, that of general principles and formal theory.5 Newton's Laws, for example, may be regarded, first, as potentially providing a description in a common sense way of the experiences people have with moving bodies, and, second, as determining by postulation, the abstract, mentally constructed world of theoretical mechanics. The same situation, with regard to concepts and linguistic levels, prevails, I think, in religion. Moreover, presuppositions also function there, as in science, in two ways, as presuppositions-by-intuition and presuppositions-by-postulation. Thus the assumption that God is real and can be known is a presupposition-by-intuition when it expresses something experienced directly. It is a presupposition-by-postulation when it is something inferred. In the latter case it is what I have called a postsupposition coming out of religion more than a presupposition underlying it. Important as is this distinction relative to the first three types of presuppositions it is even more so for the fourth, to which we now turn. Mr. Lucien Price, in his Dialogues of Alfred North Whitehead,6 reports Whitehead as saying repeatedly that all of the basic assumptions of science he learned as a student at Cambridge were set aside during his lifetime. What he was talking about, apparently, was the kind of presuppositions I have designated as the fourth class, those, for example, that refer to the structure of space and time, of matter and radiation. Here we encounter for the first time in our discussion the kind of truly scientific fundamental assumptions upon which logical developments are actually based formally and which are consciously and inextricably entwined with all aspects of the everyday work and thought of the scientist. These are the formally postulated ideas on which others are built, and that are more than feeling and attitudes and instinctive taking things for granted. These are the ones that are native to science itself, are expounded explicitly in the scientific treatises, and are indispensable to adequate exposition. Without them we could have no science, conceived now as a tough-minded, rigorous, and intellectual discipline. Now the presuppositions of religion that correspond to these of science are, it seems to me, those embodied in the so-called creeds, those I-believe statements that are basic explicitly in religious thought and refer to the nature and structure of divine reality. These are the assumptions upon which the theoretical structures of theology are founded. Without them we could have no theology, conceived now also as a tough-minded, rigorous and intellectual discipline. These are the presuppositions that are native to religion, rather than philosophy. It is, however, at this point that religion, at least Christianity, is probably misunderstood more than at any other. Let us consider, for example, the so-called Apostles' Creed: "I believe in God, the Father Almighty, Maker of heaven and earth; and in Jesus Christ His only begotten Son our Lord; who was conceived by the Holy Ghost, born of the Virgin Mary. . ." While not all Christian churches include the recitation of this creed in their ritual and many, indeed, deny that they have any such "fixed creed," yet for most Christians this series of creedal affirmations does, I believe, express in varying degrees the essential of their own basic beliefs. Therefore I feel justified in using it here as truly representative of Christian faith and thought. As I pointed out in my introductory remarks, it is often said that one of the irreconcilable differences between religion and science is that the former demands at the outset an unquestioning submission to arbitrary creeds established by authoritarian decree, whereas science has no creeds at all. But this completely misrepresents the situation. While creeds certainly have been tragically misused in the history of the church, it must be admitted that fundamentally they are not arbitrary and authoritarian. The key to understanding them lies, it seems to me, in recognizing that creeds, like other presuppositions, have both an implicit, informal pre-aspect and an explicit, propositional postphase; an experiential faith phase, and an interpretive theory phase. To borrow Mr. Northrop's language again, we have creeds-by-intuition and creeds-by-postulation. Without doubt the affirmations of the relatively simple and brief Apostles' Creed are in essence expressions of an intuitive, experiential faith, in contrast to the later and much more extensive, philosophico-theological creedal formulations and catechetical systems of propositions.7 The Apostles' Creed is, above all, a symbolic expression of what Christianity has always maintained, namely, that its foundation is empirical, and that it is rooted in the facts and events of history. The Gospels and the Book of Acts are not systematic theological treatises. One looks there in vain for expositions of a metaphysical nature. They are accounts of historical events, and especially of the greatest event, Jesus Christ When the Apostles went forth to preach, what they preached about primarily was what they had experienced. To be sure, they also tried in a modest way to provide conceptualized explanations of what had happened; but when they did they often got themselves into trouble. While the "Logos concept," for example , was indeed suggestive and useful , over and over again they failed to get anywhere with it and were then driven back to fundamentals of which they were sure. "That which was from the beginning, which we have heard, which we have seen with our eyes, which we have looked upon and touched with our hands. . that which we have seen and heard we also proclaim to you. "(I John1:1,3) I understand that most of the phrases of the Apostles' Creed were individually current in the early church as expressions of a simple faith long before theological speculation and theorizing about their content and meaning became current They were regarded not as metaphysical propositions, but as statements of experienced fact. Indeed, it required several centuries to bring them together, to accept some and reject others, and to weld them into a unified, coherent statement that was acceptable to the church, acceptable in that it was held widely to represent truthfully what the church had experienced and knew factually. By the term "church" I do not mean an ecclesiastical hierarchy or organization, but the religious community of men and women who had witnessed and experienced something tremendous, something they all knew was real, something that had revolutionized their lives to such an extent that they thought of themselves as having been "born again." The creed is first of all an expression of this experience. Its authority resides not in ecclesiastical edict or arbitrary fiat, but in its compelling nature as a truthful description of what was known to have happened to the community. It is today held to be true primarily not because of convincing theological proof or ecclesiastical decree, but because it is regarded as empirically established.8 Therefore it is meaningless to say that in religion one is confronted with a choice between creeds and facts. Here, then, we have the intuitive pre-aspect of religious creeds. Inevitably, deep experience and faith eventually seek articulate expression, theoretical "explanation," and doctrinal formulation. Thus arise the postphases and functions of religious creeds, and this is why in time they become sophisticated and replete with metaphysical intrusions. In this manner, the simple, confessional statement "I believe in God the Father, etc," accumulated in time such non confessional concepts as absolute, ultimate, infinite, incomprehensible, perfect, indivisible, omnipresent, omniscient, transcendent, and many others, all of which appear in the later creeds. When we become impatient with this verbiage, and are inclined to shrug it off as meaningless and pointless, we would do well to remind ourselves that they represent the perfectly natural and legitimate postphase kind of thinking, in search of logical coherence and theoretical interpretation, that goes on in all fields of scholarship. Nor is it true that science has no creeds. It does; namely, those assumptions belonging to Class IV that we considered earlier in this section. They are statements of basic truths that have come to light and won acceptance in the life and thought of the science community. As in the case of their religious counterparts, it took a long time to bring some of them together and to formulate them acceptably-acceptable in the sense of expressing truthfully what the scientific community has actually experienced and knows factually. There is no good reason why they should not be referred to as scientific creeds. Both the way they came into being, and the role they have played in science subsequently, are essentially the same as those of religious creeds. And these, like their religious counterparts can be understood adequately only in so far as their dual nature, their pre- and post-aspects are recognized. To recognize this is to realize that science and religion are not incompatible in this regard. Consider, for example, the presupposition (IV, 9) about cause-and-effect. As commonly understood, it represents implicit ideas corresponding closely to immediate experience. As such it expresses, in common sense language , an elemental faith in the dependability of nature , and a belief that successive events hang together and are not chaotically independent. Thus regarded it is a scientific creed-by-intuition. With the historical growth of scientific experience and thought, and in response to the need for articulation and interpretation, this simple creed has gradually been transformed by the emergence of highly sophisticated meanings far removed from those of ordinary usage. What is technically called the "causality principle" in modern physics certainly says much more than the common sense view of cause-and-effect would imply. Its full explication requires references to a large variety of concepts, such as efficacy, uniformity, identity, contiguity, simultaneity and succession ; dynamical and statistical causality; absolute necessity and probability of connection. Moreover, it requires us to distinguish carefully between the world of conceptual structures and that of common experience, between propositions about cognitions and those concerning things and events.9 Here in its explicit postphase, we have a scientific creed-by-postulation. I suggest then that in the matter of creeds science and religion are not fundamentally incompatible, but are, on the contrary, remarkably alike. There is at least one wrong impression my discussion may have created, namely, that the intuitive and postulational aspects of presuppositions and assumptions can be distinguished or differentiated sharply, or that in the experience of individual and community they operate independently, and are necessarily separated temporally. While, as I see it, there can be no doubt that they may be separated at times, it is equally true that sometimes they are not. Perhaps they are never actually completely apart. In any case, one encounters in both science and religion an existential circularity that suggests that the prefixes pre- and post- are not altogether appropriate. The great, all embracing generalizations, such as Newton's Laws and the Apostles' Creed are at once the most indispensable assumptions underlying, and the most consequential conclusions resulting from scientific and religious thought and experience. In so far as they represent experiential findings they determine and control interpretation . As interpretation they affect and to a large extent determine the meaning and the further extension of that experience. Our faiths determine our beliefs, and our beliefs greatly affect our faiths just as experimentation determines theory, while theory largely determines experimentation. Our presuppositions have profound influence upon the formation of our postsuppositions, and our postsuppositions profoundly affect our presuppositions. It is impossible to say which is in any real sense the foundation of the other. There seems to be no way of avoiding these circularities, or feedback interactions and modulations-in either science or religion. I find that many people have grave difficulty understanding these circular relationships. They seem so illogical. Logic and intuition seem to be mixed together irresponsibly. The difference between the antecedent and the consequent seems to be washed out. It seems impossible to put one's finger on a particular place to begin. I suspect that true understanding of these existential situations may be possible only to him who sees science and religion respectively from within, i.e., learns to see them and know them by actual participation in the life and thought of the scientific or religious communities. Science and religion are fundamentally much more alike than is commonly supposed. Neither is essentially a logical structure deriving like a geometric system from underlying assumptions by syllogistic processes, though both do require rational systems of thought for their complete development and expression. Neither demands as a first step assent to prescribed formal assumptions. Of course, both do have presuppositions, and their attitudes toward them are essentially alike. In kind these presuppositions are surprisingly similar. Moreover, in both they appear in two different aspects or phases, which I have referred to as the pre- and postphases. In the former they are implicit, function as presuppositions-by-intuition, and are "basic" psychologically, representing fideistic predispositions more than presuppositions. In the latter they are explicit, function as presuppositions-by-postulation and are "basic" logically, expressing a critical demand for coherence, authentication, and interpretation. Implicitly they are part of the so-called "foundations"; explicitly they are actually postsuppositions and part of the "superstructure." Unfortunately, however, the analogy of foundation and superstructure, and the terminology of "pre" and "post" are misleading, since no part of either scientific or religious experience and thought is necessarily prior to, or the indispensable foundation of , any other. Therefore I suggest that science and religion are both circular. In closing let me say that I realize that I have only scratched the surface of my subject. Many interesting, and some vexing, problems and aspects of the subject have remained completely untouched by my remarks. I realize also that 1 have not said anything profound. I am not, however, going to apologize for this. One of the basic principles of the great teacher in whose memory this lecture was prepared and delivered was that each of us is responsible to work and produce up to his own capacities , but no more. He used to say that not all of us can be equally profound or equally creative. What he considered important was that each of us be creative in some way , according to his own ability. His famous summer colloquia for college physicists were designed with great ingenuity to encourage and stimulate the ordinary run-of-the-mill physics teacher to bestir himself and to contribute something, no matter how humble, which would constitute for him an original contribution. Many a time have I seen him put somebody at ease who was apologetic about, say, a gadget he was exhibiting, by saying "Look here! Did you make that? (Yes). Has anybody else ever made it? (No, not that I know of.) Then it is original with you? (Yes.) Is it good for anything? ( Yes, it really helps students to understand something better.) Well, then, be proud of it. Don't apologize for it. You will see that all sorts of people will be interested in it." At the same time, since he had a marvelous sense of humor, his eyes would twinkle just the right amount, so that with his praise and encouragement would go a judicious amount of kindly deflation of any tendency toward overevalutation of his praise. I am neither a philosopher nor a theologian, and what is worse, after only seven years of deaning, even my friends now speak of me as having been a physicist. Why, in view of these pertinent, and disillusioning facts, did I accept the invitation to give this lecture? Because Professor Stewart would have wanted me to in spite of my limitations, since it presented an opportunity for me to make a modest contribution as best I could. I knew of no better way to honor his memory than to do what he would have wished. Believe it or not, if he were here, he would manage to say some nice things about my lecture, though I am quite sure it would be with that kind but completely meaningful twinkle in his eyes. 1. I suggest the following books as being more or less representative of the literature. All of them consider basic assumptions and presuppositions explicitly, though they differ widely in purpose, content, scope, and point of view. Broad, C. D., Religion, Philosophy and Psychical Research, (and other of his books), (Routledge & Kegan Paul, London, 1953). Burtt, E. A., Metaphysical Foundations of Modern Physical Science, (Harcourt, Brace, New York, 1927). Caldin, E. F., The Power and Limits of Science, (Chapman & Hall, London, 1949). Cassirer, E., Determinism and Indeterminism in Modem Physics, (Yale	University Press, New Haven, 1956). Coulson, C. A., Science and Christian Belief, (University of North Carolina Press, Chapel Hill, 1955). Dotterer, R. H., Postulates and Implications, (Philosophical Library, New York, 1955). Polanyi, M., Science, Faith and Society, (Oxford University Press, London, 1946). Whitehead, A. N., Science and the Modern World, (Macmillan, New	York, 1925). International Encyclopedia of Unified Science, (University of Chicago Press, Chicago). Aside from the above, the standard treatises on the philosophy of science and on the nature and methodology of religion are, of course, also relevant. 2. Whitehead, A. N., Science and the Modern World, pp. 12 and 23, (Macmillan, 1926). 3. Throughout this paper 1 shall be speaking of religion in terms of the Judaeo-Christian tradition, since I know virtually nothing about any other. 4. Northrop, F. S. C., The Logic of the Sciences and the Humanities, pp. 36, 62 (Macmillan, 1947). 5. Frank, Philipp, Philosophy of Science, pp. 1, 2, etc. (Prentice-Hall, 1957). 6. Price, L., Dialogues of Alfred North Whitehead, pp. 131, 215 (Little Brown, 1954). 7. This difference between the earlier and later creeds becomes very evident when one studies such works as: Schaff, P., Creeds of Christendom (3 Vols.) (Harper, 1905), Harnack, A. V.. Dogmengeschichte (Mohr-Siebeck, Tübingen, 6th ed., 1922), Matthews, W. R., God in Christian Thought and Experience (Nisbet, London, 1930). 8. Actually the Apostles' Creed contains also affirmations of a fideistic hope, e.g., "life everlasting," aside from these concerned with experienced fact. 9. For an excellent critical review of this subject see Victor F. Lenzen, Causality In Natural Science (Charles C. Thomas, 1954).